Yes, someone has actually hacked an IKEA piece of furniture and turned it into an Arcade Cocktail machine. Breaking News: Al updates his bio! In an astonishing turn of events, Al finally updates his Bio on the Pins and Vids About Us page. Al was previous believed to not have enough computer skills to accomplish this task, but we have all been proven wrong. But Al really has updated his bio and told quite a story. I guess I’m going to have to update mine now as his puts mine to shame. Go read it. Now! It really is quite funny. Here… I’ll do all the work for you. Just click here. 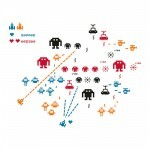 Looks like a great blog about game rooms has just done a review of Pins and Vids IV: A New Hoax. They talk about one of the fun extras we’ve included on the DVD, so be sure to read the review to learn more about it. 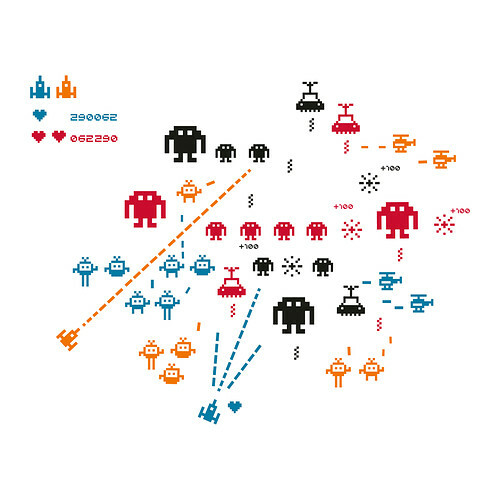 Looks like IKEA is trying to get into the Retro Gaming trend and now has some wall art stickers that appear to be inspired by old 8-bit style game art. You can check them out at IKEA or order from their website here. If you missed out on getting a ColorDMD the first time around for your Attack From Mars, now is your chance, if you are quick. It appears there are now some available at the ColorDMD website and others such as Bay Area Amusements and Planetary Pinball may also have them in stock for a short time. If you haven’t checked out the ColorDMD, you can see the installation process and video of it in action on the latest Pins and Vids 4 DVD.